Broccoli is grown on an estimated 800 acres throughout New York State. Multiple plantings are typically grown along with other Cole crops such as cauliflower, cabbage and kale on small-scale diversified vegetable farms. Broccoli is predominantly grown from transplants set in April and May for a spring crop and in late June through August for a fall crop. Broccoli that is harvested in July and early August tends to have very high cull rates due to abnormalities caused by heat stress. 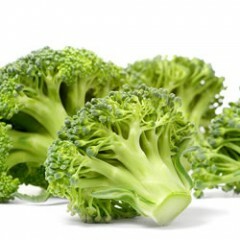 Broccoli is cut during the cooler part of the day and sold as soon after harvest as possible, as it does not store well. Fortunately, recent genetic breakthroughs have overcome broccoli's susceptibility to heat stress and broccoli growers in New York look forward to the availability of new varieties adapted to the hot and humid summers of the Northeastern United States. Cornell University is leading an ambitious effort to develop a $100 million broccoli industry in the Eastern United States. Below you will find educational information and results of our research trials.